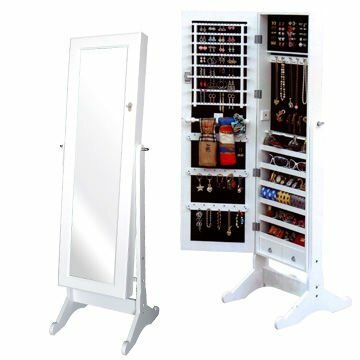 Perfect Solution: Mirror & Accessory Stand ..
Crush Boutique offers a perfect solution for an accessory hoarder like me, a mirror stand with countless jewelery compartments to store : rings, necklaces, sunglases & bracelets ..
That would save tons of space! Available in Black & White.. I only wish it was available in light oak or gold then I would have got one with a heart beat ! 70 KD , Delivery included..